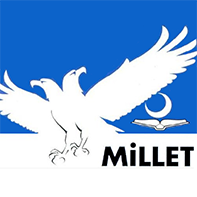 The Nation Party (Millet Partisi) was founded as the Reformist Democracy Party in 1984 by Aykut Edibali and renamed itself in 1992. The party follows a conservative-right political line, and was only represented in the parliament in 1991 through a coalition with the Welfare Party (a predecessor of the Felicity and Virtue parties). Its emblem is a two-headed white eagle on a blue background.